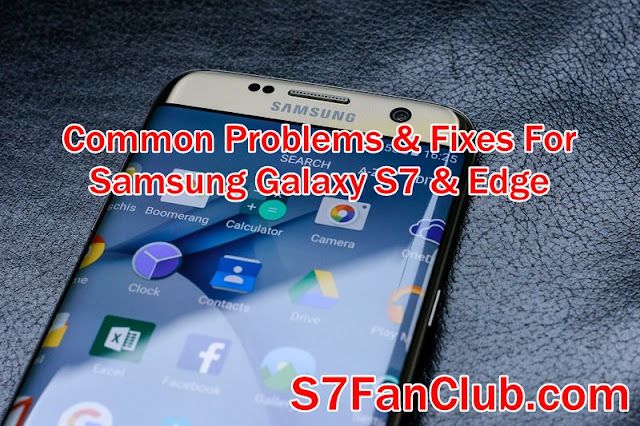 Home » How To » How To Fix Some Common Galaxy S7 Edge Problems? How To Fix Some Common Galaxy S7 Edge Problems? Samsung Galaxy S7 and Galaxy S7 Edge are the best smartphones now available on the market shelves. Besides its amazing features, the look of this phone is also very striking that compel most of the smartphone users to switch to this phone. But having all these specialties does not mean that Samsung Galaxy S7 is fault free. There is plethora of Galaxy S7 Edge Problems that make us to write about them. So, here are some of the common Galaxy S7 Edge Bugs and Fixes. If you are dealing with such problems, you can easily get those fixed with the help of this article. Most of the users might not be facing this problem but reports suggest that some of the users of S7 do face Wi-Fi problems. The S7 owners experience the Wi-Fi problems like Gmail do not sync properly over a Wi-Fi connection. This seems to be the major Samsung bug that needs the fix by the company itself but the owners of the phone can also try its temporary solution. Fix: if this problem is caused by the Bluetooth, then try disabling Bluetooth or also, disabling your location in the background can help to fix such trouble of wireless connection. Quite a number of Galaxy S7 owners run into the issue of audio distortion or sound crackling. This problem seems to be due to speakers but it is quite noticeable with earphones and headsets too. So, of you are facing such problems, you can try the following fix. Fix: Clean the grilles of the speakers thoroughly to make sure there is no dirt or debris stuck inside them. Or let your speakers dry out to stop audio distortion. You can also switch UHQ Upscaler on and off again from the Audio settings to eliminate sound crackling. This one is quite a major issue, if you are facing it. Most of the people seem to be affected with this problems and here is the simple fix to this major problem. Fix: This might sound counter – intuitive but it works for sure. Try a simple reset to your phone to solve this problem. Both the siblings, S7 and S7 Edge are having the palm detection feature which is present in order to avoid accidental bumps while you are holding your phone. The problem arises when this detection does not work properly. Fix: There is no software fix for this problem, but you can avoid this, by holding your phone differently or putting it in some case. Overheating is another major problem of the Galaxy S7 and S7 Edge. Some face it while charging while some are experiencing it when they are just using it. If you are facing this problem, you can easily tackle this by trying these simple fixes. Fix: While charging your phone, stop using it. This can help fix the problem. Or also, you can try wiping the cache partition that can fix the persistent overheating of the phone. If you have bricked your Samsung Galaxy S7 or Galaxy S7 Edge’s software and your phone is boot looping or stuck at Samsung screen, there are two kinds of fixes for this kind of issues. Fix: Boot your Samsung Galaxy S7 or Edge into Recovery mode by pressing Volume Up + Menu + Power On Key. Now you have to hard reset your device, it will erase all of your data from device and your device will become brand new as just coming from the factory. If you tried to Root Samsung Galaxy S7 or Edge with wrong files, your device will probably stuck at Samsung screen and solution to this issue is to Flash Stock ROM on Samsung Galaxy S7 or Edge. Samsung claimed Samsung Galaxy S7 & Edge as Water Proof devices, however this is not the case. Samsung Galaxy S7 or Edge is only water resistant in reality. If you have soaked your Galaxy S7 or Edge into water for a long time, it will still work, though there will be issues like moisture detected in charging port or after certain period of time, your phone’s AMOLED screen will be showing pink and green lines and if that’s not treated, that will lead to a dead AMOLED panel. Fix: In order to Fix pink and green lines appearing on your Samsung Galaxy S7 or Edge, you will need to claim your phone’s warranty and Samsung will have to replace your smartphone’s AMOLED display for FREE. If you don’t have the warranty, in that case you will have to spend your money to get AMOLED panel replaced on Samsung Galaxy S7 or Edge. Besides these issues, if you are experiencing some other Galaxy S7 Edge Bugs, then let us know in the comments below. How To Fix Some Major Samsung Galaxy S7 Problems?